This budget keyboard provides satisfying key feel while keeping the decibels down. The AmazonBasics Wireless Keyboard, which Amazon trumpets as “quiet and compact,” is built for this age of open work environments. When personal space is at a premium and even the clattering of a keyboard can feel intrusive, this discreet device helps everyone get along. This review is part of our ongoing roundup of the best wireless keyboards. Go there for information on our top picks and other competing products, and how to choose the best model for you. 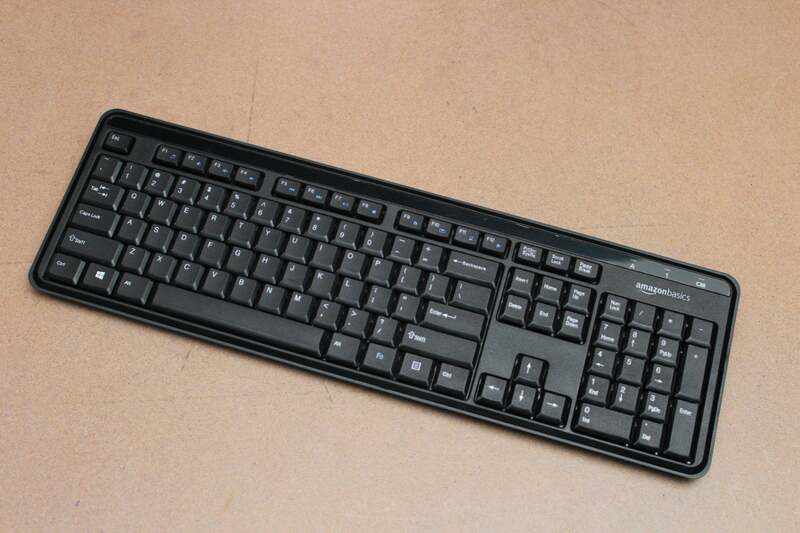 The budget-priced keyboard measures 5.6 x 17.7 x 0.9 inches and is constructed of lightweight plastic. Because it weighs a hair over one pound you may best tempted to throw it in a laptop bag and take it with you, but it’s not likely to withstand a lot of road wear (this is a $20 keyboard we’re talking about). If you do take it on the go, be sure to provide plenty of padding. Despite its modest size, the keyboard manages to include a full set of alphanumeric and function keys as well as a number pad. The function keys double as a dozen multimedia hotkeys for music, volume, mute/unmute, back, forward, play/pause, stop, home, email, file explorer, and favorites. Three LED indicators above the number pad let you now when you caps and number locks are activated and when the batteries are getting low. Two standard AAA batteries power the keyboard, and a pair is provided in the box. A battery level indicator above the number pad will blink for 10 seconds to warn you when the batteries get low. LED indicators for the caps and number locks are adjacent to this. Pairing the keyboard to your Windows computer requires only connecting the provided USB receiver to one of its ports. Once I inserted the dongle, I got a notification that Windows was setting it up. Within seconds, the keyboard was active. Amazon’s claim about the quiet of the keys is no exaggeration.They are dead silent whether you’re typing an email or furiously crunching numbers. Each key is slightly contoured and textured and makes satisfying thump at the bottom of the keystroke, all of which nicely enhances the tactility of touch typing. 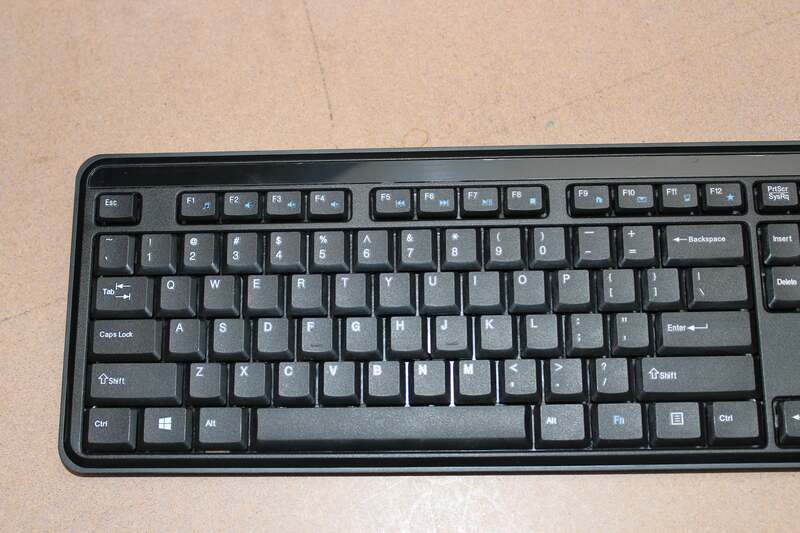 The function keys double as multimedia hot keys for email, music playback, and web navigation. At this price point you shouldn't expect much in the way of ergonomic design. The keyboard is sculpted to have a natural slope that I found comfortable as-is. There's also a pair of flip-down legs underneath if you want a little more lift. In either case, half of each palm will hang over the keyboard edge when your fingers are in the home-row position, so a wrist pad may be in order if that’s uncomfortable for you. 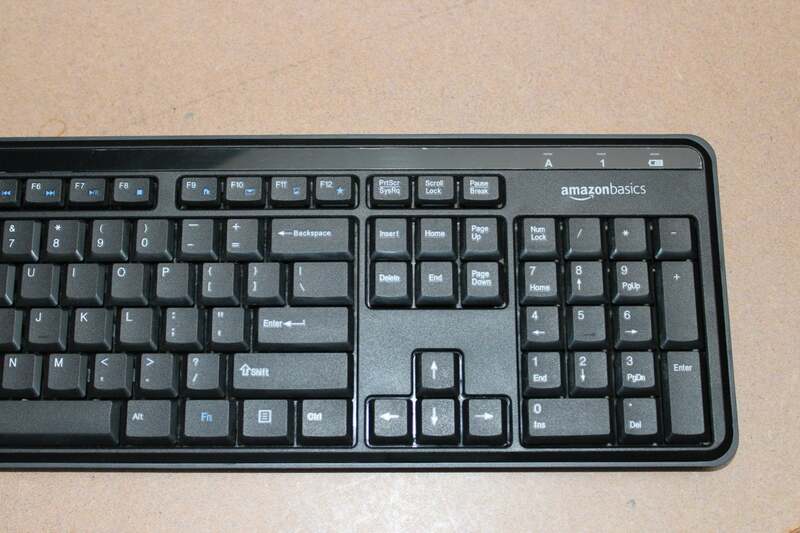 In all, the AmazonBasics Wireless Keyboard is a pleasingly quiet, full-featured keyboard. It may not look like much, but it's an immediate and economical solution for keeping the peace at work or at home. AmazonBasics Wireless Keyboard's quiet keys make it ideal for open office plans, dorm rooms, and other shared spaces.